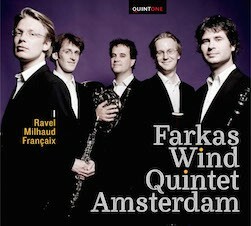 The Farkas Wind Quintet Amsterdam is a Dutch ensemble, founded in 1997. Few small ensembles can boast the rich spectrum of colour and texture achievable with the wind quintet. The very nature of such striking differences in timbre between the instruments, and thus the myriad combinations of these when combined, grant the author a most versatile of compositional palettes. Whilst evolved from chamber ensembles of the great Classical era – Mozart and Haydn both employed wind groups of varying instrumentation – the modern version (consisting of flute, oboe, clarinet, bassoon and French horn) has proved a sumptuous source of inspiration for a league of twentieth century composers.